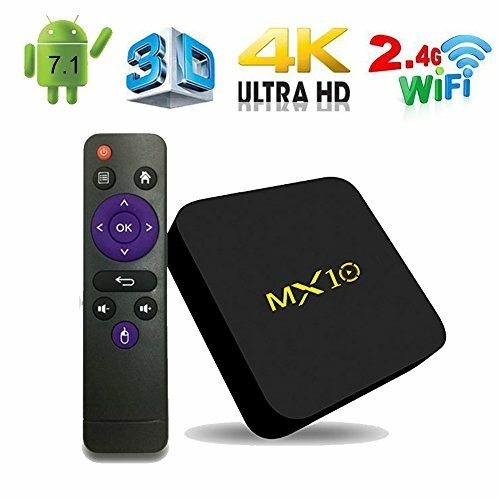 MX10 android tv box is the most powerful tv box on the market! Support Decoder format:"4K VP9 Video decoder, H.265/H.264 video decoder 1080P other video decoders (VC-1, MPEG-1/2/4, VP6/8)"
[2018 Upgrade Version] MX10 android box runsthe lastest android 7.1 version,Android tv box 7.1 raises the bar in performance and usability with a slick lag-free interface, compatibility with the latest android applications such as youtube,google play store and many games, and support for more USB devices. [Enhanced Android TV Experience] The set top box is powered by the newest RK3328 64 bits Quad core CPU up to 2 GHz ultra-high frequency, more than 4 times performance improvements. It is advanced in image processing and computing. [True 4K Feeling] The android smart tv box supports playing almost all popular audio and video formats, bringing you to enjoy 4K ultimate HD video. Watch high-definition H.265 1080p streams on youtube and more. [Download Newest Apps From Google Play Store] This set top box is installed with Google play store,you can downloading the newest apps and online from it,to watch videos, play games, enjoy music, and so on, also support 2.4GHz wireless mouse and keyboard via 2.4GHz USB dongle. [12-Month Worry-Free Warranty] We offer MX10 smart tv box 100% with 12-month worry-free warranty and on-time customer service. If you have any questions about this product by Mrtech, contact us by completing and submitting the form below. If you are looking for a specif part number, please include it with your message.